Tuolumne County is a medium-sized county in the Sierra Nevada. It was one of the original 27 counties in 1850, with its county seat at Sonora, but at that time it stretched as far west as Del Puerto Canyon in today's Stanislaus County. It was carved back to its current size with the creation of Stanislaus County in 1854. Much of the county is uninhabited wilderness; indeed, most of the northern half of Yosemite National Park is within the county. Because of this isolation, most people do not see much of the Tuolumne high country, except for Tuolumne Meadow on the Tioga Road in Yosemite (that road winds in and out of Tuolumne but most of the better-known stops are in adjacent Mariposa County). Tuolumne County has a wide range of habitats from grasslands at the edge of the Central Valley, to chaparral and oak woodlands, up into various coniferous forests, and then extensive alpine high country. The Tuolumne River was dammed nearly a century ago to form Hetch Hetchy Reservoir, used as the freshwater supply for San Francisco. 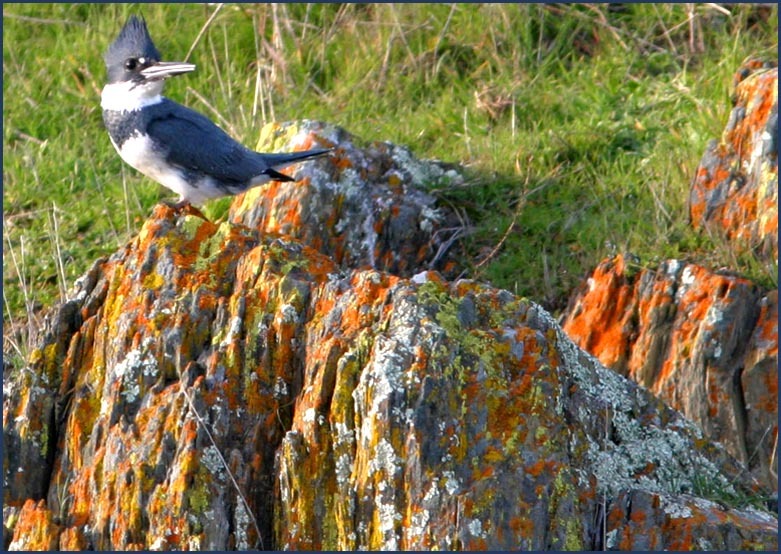 It turns out that I have only this photo from Tuolumne County: a male Belted Kingfisher on a very colorful, lichen-covered rock along Rock River Road in the extreme western edge of the county. It is still rolling, oak-studded grasslands here. Much of Tuolumne County is higher in the Sierra Nevada, and its most famous locale is the high-elevation Tuolumne Meadow in Yosemite National Park, shown here in early summer before the snow has melted (below; June 1971).